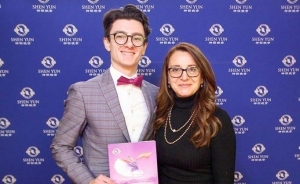 Last weekend my family and I were treated to a surprise gift of getting to attend a performance of Shen Yun, a New York-based performing arts organization that draws from 5,000 years of China’s civilization and cultures to create original music and dance performances. The show traveled through our city before, but since we didn’t know anyone who had been we had no idea what to expect. Plus, although both my daughters are involved in dance, they tend to enjoy shows a little more on the action and adventure side. First and foremost, the dancing is perfectly synced and mesmerizing to watch. The show did have two pieces that were strictly musical performances, but its main focus and draw was the dancing. For good reason, because it was out of this world. Every dancer was in perfect step, and they pulled off synchronized routines and acrobatic style moves with what seemed like little effort. My youngest leaped and turned all the way to the car. That’s not to say there weren’t plenty of “don’t try this at home” moves as well. What these dancers did took some intense practice. The live music was a pleasant surprise. One thing I didn’t expect was the live orchestra. I’ve seen similar dance performances where the music is prerecorded. This is often necessary and more affordable for a traveling dance troupe, but having the live accompaniment really brought this up to the next level. The group an ideal success story. 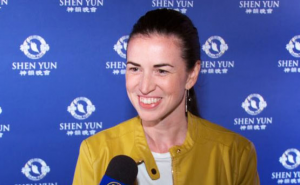 If you want to teach your kids the importance of hard work, dedication, and persistence, Shen Yun is a living example. The organization started in 2006 with just one company and orchestra. Today, they boast five full simultaneously-traveling companies covering 20 nations, 150 cities in 500 performances. That is some significant growth. They show off the importance of freedom. 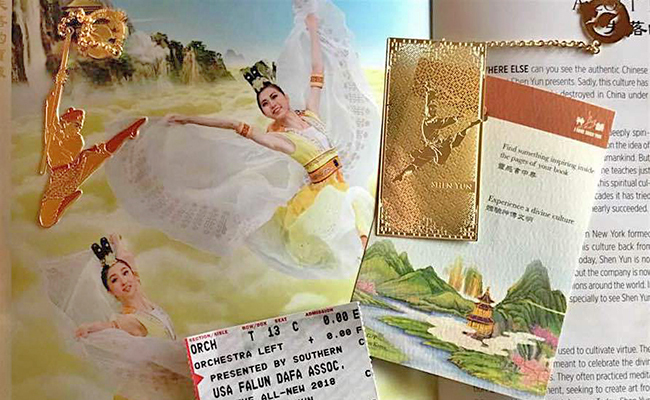 There is a little bit of politics in Shen Yun, as two of the pieces were based on true incidents of young people being arrested for practicing the religion of Falun Dafa (Falun Gong), a form of Buddhism. 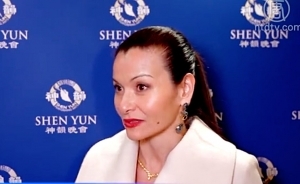 According to Shen Yun’s own site, and a sentiment that was stressed more than once in the show, their performances cannot be seen in China itself, where they say, “the treasure that is traditional Chinese culture has been displaced by communism.” This is a great lesson for young viewers that although people disagree about many things in free countries, they are fortunate to have that freedom to do so. Never take that for granted. This made for some good discussion on the way home for us. The show has a warm and goofy sense of humor. The presentation was very formal, but it wasn’t stuffy or boring. There were plenty of jokes from Masters of Ceremony and slapstick sight gags. As impressed as older audiences can be with technique, there always needs to be something more lighthearted to keep younger audiences entertained. They have patented their own technology. One of the things Shen Yun featured was a fully animated backdrop that made it appear as if the performers could travel in and out of animated sequences with ease. This was a feat that not only took perfect timing from the performers but also required some innovative tech know-how. 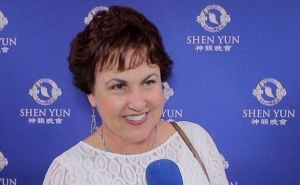 The result is an incredible digital backdrop that Shen Yun has been able to legally patent. Even the costumes tell a story. Some of the dances not only showcased historically and culturally inspired costumes, it incorporated them into the dance. This included long “water sleeves” from the Han Dynasty, jingling charms from the Hmong village, “flower pot” shoes of the Qing Dynasty, and soaring handkerchiefs. Every piece was filled with bright color or flowing designs. You will learn something new. In addition to the costumes, the audience learned about traditional Chinese folktales, witnessed dances from different eras and ethnicities, learned a word or two in Chinese, and were introduced to the sound of an erhu, a beautiful two-stringed instrument played similarly to a small cello. I love it when we can sneak an educational experience into entertainment without kids knowing it. They’re not afraid of their geeky side. At one time, the Masters of Ceremony ask, “Do you ever wish you had a superpower?” Shen Yun’s performances did take many trips to supernatural and fantasy realms. In their various dances, there are superpowered beings, mythical beasts, and even a jump through a dimensional loop. The stories behind the dances are explained ahead of time, but many of the pieces are easy to follow and short enough to hold the interests of all ages. It’s a world showcase of talent. The majority of dancers themselves were of Chinese descent, but they came from all over the world including Poland, Australia, China, the United States, and Japan. The orchestra’s maestro, an Armenian, conducted a group professional musicians performing on both western and traditional Chinese instruments. 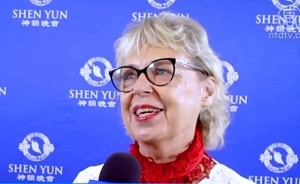 There was also a vocal performance by a soprano who performed in a bel canto style with Chinese diction, something many in the audience hadn’t before heard. 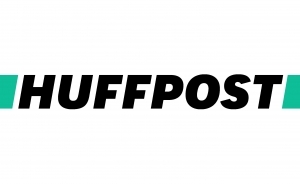 It showed how, according to Shen Yun, ancient Chinese theater and early European opera shared the same singing technique. There is one reason I should mention that might not make this production completely perfect for the family: it may not be budget friendly for everyone. My family of four was lucky enough to receive tickets as a gift from my boss. Otherwise, we couldn’t have been able to afford this wonderful experience at this time. For our local performances, tickets ranged from $80 to $120, a bit more than a traveling Broadway show in the area. Still, the audience was wall-to-wall full, enthusiastic, and made up of all ages and backgrounds. The show was announced several months in advance, so I would think this gave people a chance to budget for a special outing. Also, the company and members of the organization want to make sure their performance meets the expectations and of everyone who sees it. 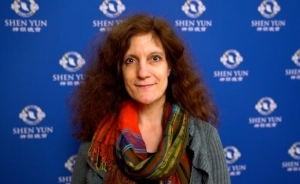 This means be prepared to be approached by Shen Yun representatives asking you what you thought, and if you would be willing to talk about it on camera. They even had a backdrop set up in our theatre’s foyer like those at award show events. This is by no means mandatory, but many people approached seemed happy to share their feelings about the show. However, they are very strict with cell phones and photos, so makes sure to keep those in your pocket or purse. For us, Shen Yun wouldn’t be something we could afford to see each visit, but I recommend seeing it at least once. They put on an amazing show, and you will leave with a smile on your face and a spring in your step. Shen Yun’s current tours continue through May throughout the United States, Canada, Asia, Mexico and South America, the Middle East, and Europe. They present an entirely new show with original pieces every season. Their full schedule can be found at shenyunperformingarts.org. "GeekMom" is a parenting, technology, and culture blog.